Whether you’re a landlord or a tenant, it’s important to keep yourself warm and protect your property during Oklahoma’s chilly winter months. 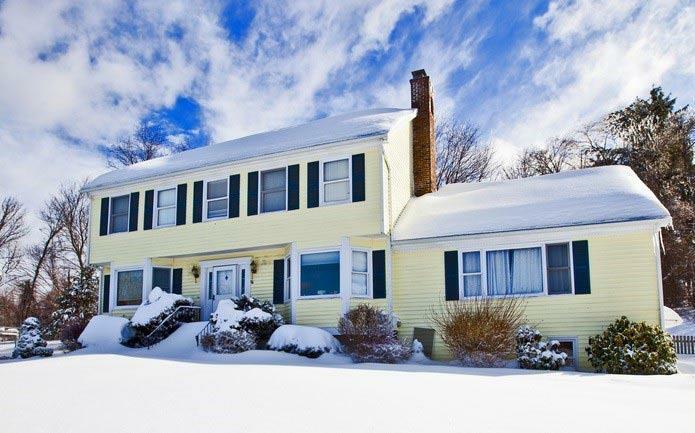 However, our mild fall weather and late winters make it easy to forget to winterize your home. Proper home winterization can help you save money on utility bills, avoid damage from ice and cold weather, and be more comfortable. To help you winterize your Oklahoma rental home, here are a few winterization tips. A properly functioning furnace is key for a warm and comfortable winter. Unfortunately, it’s very common for people to forget to perform regular furnace maintenance and make sure it’s functioning at its best. If your OKC rental house has been unoccupied for a while, you should first test the furnace to make sure it’s working properly. Set the thermostat for a high temperature to ensure it turns the furnace on, and then wait for it to start pushing out warm air. If it’s running OK, reset the thermostat back to a normal temperature. If it’s not, you can try to figure out the problem yourself or call a furnace technician for service. Along with a test run, you should also clean your furnace’s air filter regularly, along with any intake and output vents. That way you can be sure your furnace is getting enough airflow and that it’s able to push warm air into every part of your rental home. If your house has a wood-burning fireplace or furnace with a chimney, you need to be sure the system is ready to use before you start any fires. Fortunately it’s not hard to check if your chimney is in good condition (though repairing it can be expensive). First, you’ll need to make sure your chimney is free from obstruction so smoke and ash can get out. Take a flashlight and look up the chimney to see if you can see any debris such as sticks, leaves, or animal nests. If you don’t see any blockages, roll up some newspaper and light it with a lighter, then head outside. If you see smoke coming out of the chimney, you’re good to go. If no smoke is coming out of your chimney, it may be dirty and in need of a cleaning. Chimney cleaning logs use chemicals to burn out ash and creosote inside your chimney, but they’re only suitable for chimneys that aren’t really that dirty. If your chimney is fully blocked, you’ll need to call a professional chimney sweep and have them clean your chimney. Alternately, if you don’t plan on using the fireplace that much, you can also purchase a chimney balloon to block cold air from entering your home through the chimney. This is simply an inflatable plastic balloon that you lodge in your chimney. They can save you big on your heating bills, though, by preventing cold drafts and keeping the temperature in your home higher. Chimney balloons are available online, as well as at home improvement stores around the city. One of the biggest dangers during Oklahoma winters are sudden drops in temperature that can freeze your pipes and cut off your water supply. The best way to keep this from happening is to ensure your pipes are properly insulated and prepared for winter weather. If you have any pipes running through crawl spaces or that are exposed to winter air, you need to make sure they’re insulated well. Foam insulation will work in a pinch, though fiberglass or specialized pipe insulation is better. Also, be sure to shut off your exterior hose faucets and disconnect garden hoses. These are some of the first pipes to freeze in most homes, and if the pipe bursts it can create a nightmare of water damage and repairs. Small, cold drafts can come from many places in your Oklahoma rental house. Though they might not seem like much on their own, combined they can sap your home of heat and cost you a lot on your utility bills. Fortunately, there are a few things you can do to defeat the drafts. It might not be the prettiest solution, but window film - the clear, plastic coating that goes over the inside of your windows - can solve many problem drafts around windows. You can pick up window film at any home improvement store and many big-box retailers as well, and it only takes a few minutes to install. Another good draft solution is door seal tape, which you apply to the seal between your doors and the wall. This creates a tighter seal that allows less air to escape when the door is shut. If you have a drafty door, this tape can help solve the problem in an instant. Ice and snow don’t only create problems with frozen pipes and slippery driveways. They can also cause leaks and water damage in your home, especially if you have dirty or clogged gutters. Cleaning your gutters will help reduce any problems with snow or ice buildup and keep your rental home safe from water damage. Why are dirty gutters so dangerous? When water pools in your gutters due to a clog, it’s more likely to freeze when the temperature drops. This creates a block of ice in your gutters, which itself takes time to melt. This then slows water flow down further, making it more likely that more water will freeze in the same place. This can eventually create what’s called an ice dam, a blockage of ice that can snap gutters off roofs and peel up shingles, letting water leak into the roofing below. These are a few of the best ways to get your Oklahoma rental house ready for the winter months. To learn more about managing or renting a rental home in Oklahoma City, call us today at Elite Real Estate and Leasing. We manage and rent properties across the Oklahoma City metro, and we would love to help you manage your rental house as well. Call us at 405-285-2635 or visit our Facebook, Twitter and Google+ pages for more information.